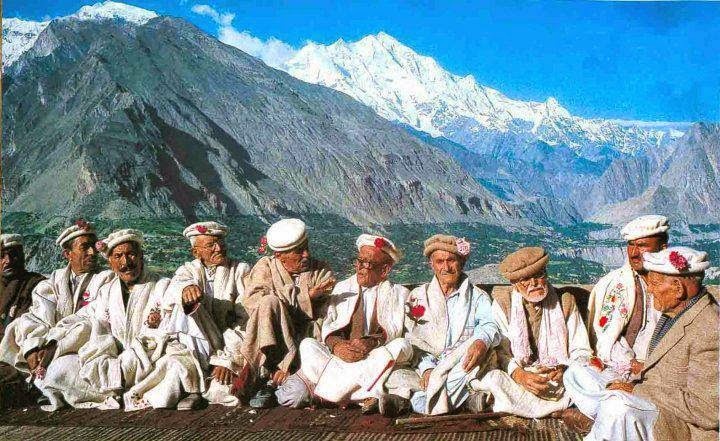 The (Burushaski: ہنزہ, Urdu: ہنزہ‎) is a mountainous valley in the Gilgit–Baltistan region of Pakistan. 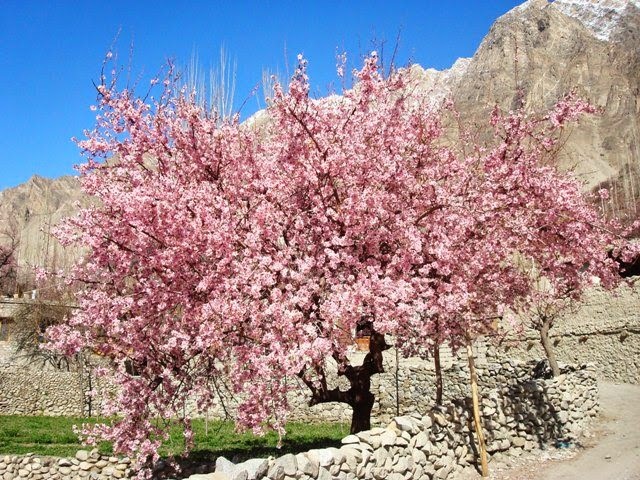 The Hunza is situated north/west of the Hunza River, at an elevation of around 2,500 metres (8,200 ft). 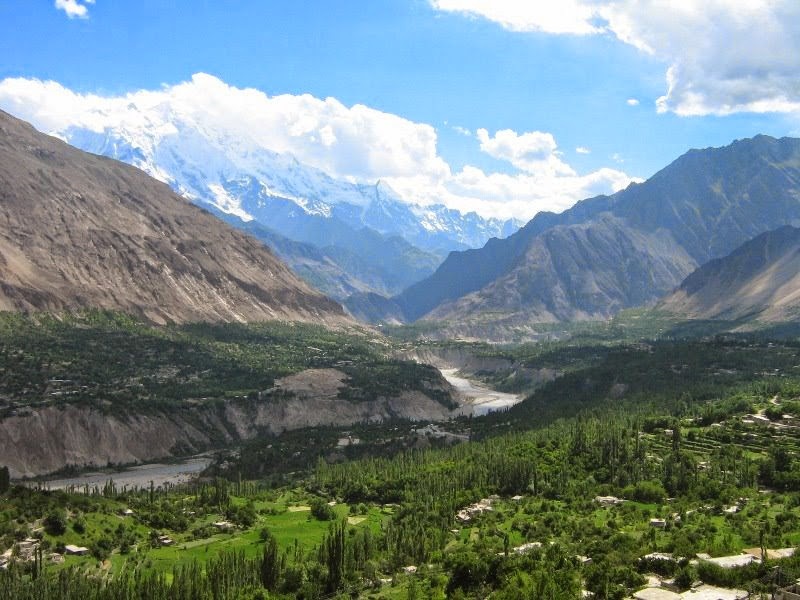 The territory of Hunza is about 7,900 square kilometres (3,100 sq mi). 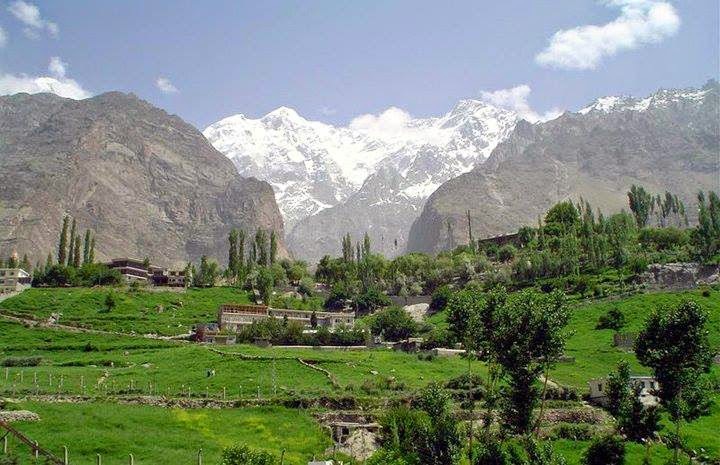 Aliabad is the main town is while Baltit is a popular tourist destination because of the spectacular scenery of the surrounding mountains like Ultar Sar, Rakaposhi, Bojahagur Duanasir II, Ghenta Peak, Hunza Peak, Passu Peak, Diran Peak and Bublimotin (Ladyfinger Peak), all 6,000 metres (19,685 ft) or higher. 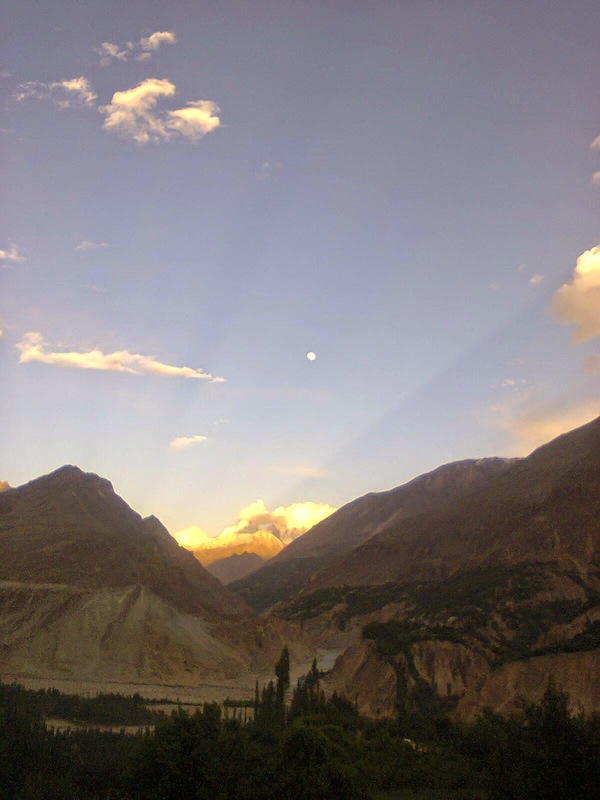 (Urdu: دریائے ہنزہ‎) is the principal river of Hunza, in the Northern Areas of Pakistan. It is formed by the confluence of the Kilik and Khunjerab nalas (gorges) which are fed by glaciers. It is joined by the Gilgit River and the Naltar River before it flows into the Indus River. The river cuts through the Karakoram range, flowing from north to south. The Karakoram Highway crosses the Hunza River near Hunza and Nagar valleys. (KKH) is the highest paved international road in the world. It connects China and Pakistan across the Karakoram mountain range, through the Khunjerab Pass, at an elevation of 4,693 metres (15,397 ft) as confirmed by both SRTM and multiple GPS readings. 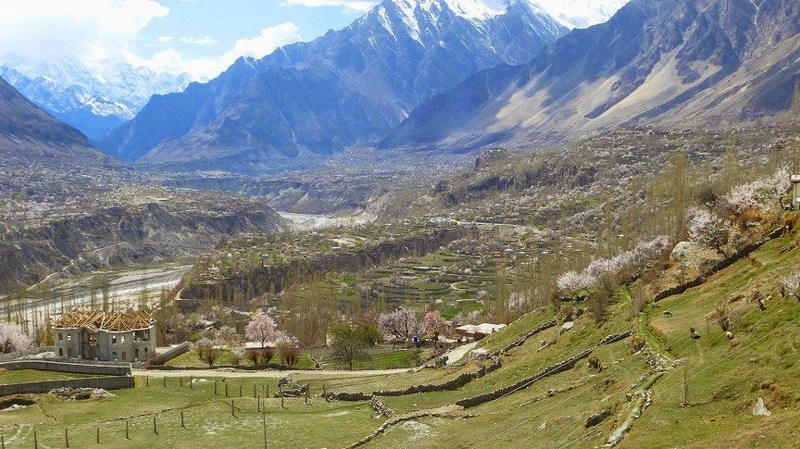 It connects China's Xinjiang region with Pakistan's Gilgit–Baltistan and Khyber Pakhtunkhwa regions and also serves as a popular tourist attraction. Due to its high elevation and the difficult conditions in which it was constructed, it is also referred to as the "Eighth Wonder of the World." The Karakoram Highway, also known as the Friendship Highway in China, was built by the governments of Pakistan and China, it was started in 1959 and was completed in 1979 (open to the public since 1986) about 810 Pakistanis and about 200 Chinese workers lost their lives, mostly in landslides and falls, while building the highway. The Chinese workers who died during the construction are buried in the Chinese cemetery in Gilgit. The route of the KKH traces one of the many paths of the ancient Silk Road. On the Pakistani side, the road was constructed by FWO (Frontier Works Organisation), employing the Pakistan Army Corps of Engineers. Recently, the Engineer-in-Chief's Branch of the Pakistani Army has completed a project documenting the history of the highway. A book 'History of Karakoram Highway' has been written by Brigadier (Retired) Muhammad Mumtaz Khalid. It is in two volumes. In the first volume the author discusses the land and the people, the pre-historic communication system in the Northern Areas, the need for having an all weather road link with Gilgit, and the construction of Indus Valley Road. The second volume records events leading to the conversion of the Indus Valley Road to the Karakoram Highway, the difficulties in its construction, and the role of Pakistan Army Corps of Engineers and the Chinese counterparts in its construction. The highway, connecting the Gilgit–Baltistan region of Pakistani Kashmir to the ancient Silk Road, runs approximately 1,300 km (810 mi) from Kashgar, a city in the Xinjiang region of China, to Abbottabad, of Pakistan. An extension of the highway south west from Abbottabad, in the form of N-35, meets the Grand Trunk Road, N-5 at Hassanabdal, Pakistan. The highway cuts through the collision zone between the Eurasian and Indian plates, where China, Tajikistan, Afghanistan, and Pakistan come within 250 kilometres (160 mi) of each other. Owing largely to the extremely sensitive state of the Kashmir conflict between India and Pakistan, the Karakoram highway has strategic and military importance to these nations, but particularly Pakistan and China. On June 30, 2006, a memorandum of understanding was signed between the Pakistani Highway Administration and China's State-owned Assets Supervision and Administration Commission (SASAC) to rebuild and upgrade the Karakoram Highway. According to SASAC, the width of the highway will be expanded from 10 to 30 metres (33 to 98 ft), and its transport capacity will be increased three times its current capacity. In addition, the upgraded road will be designed to particularly accommodate heavy-laden vehicles and extreme weather conditions. Since 2 p.m. on January 4, 2010, the KKH has been closed in the Hunza Valley, eliminating through traffic to China except by small boats. A massive landslide 15 kilometres (9.3 mi) upstream from Hunza's capital of Ganish created the potentially unstable Attabad Lake which reached 22 kilometres (14 mi) in length and over 100 metres (330 ft) in depth by the first week of June 2010 when it finally began flowing over the landslide dam. The landslide destroyed parts of villages while killing many inhabitants, while the subsequent lake displaced thousands and inundated over 20 kilometres (12 mi) of the KKH including the 310 metres (1,020 ft) long KKH bridge 4 kilometres (2.5 mi) south of Gulmit. It is highly questionable whether the lake, which reached 27 kilometres (17 mi) in length in 2011, will drain. Goods from and to further north are transported over the lake by small vessels, to be reloaded onto trucks at the other end. Milestone near Besham in Pakistan. At 806 kilometres (501 mi) in length, the Pakistani section of the highway starts in Abbottabad, although the N-35 of which KKH is now part, officially starts from Hassanabdal. The highway meets the Indus River at Thakot, and continues along the river until Jaglot, where the Gilgit River joins the Indus River. This is the place where three great mountain ranges meet, the Hindukush, the Himalaya, and the Karakoram. The western end of the Himalayas, marked by the 9th highest peak in the world, Nanga Parbat can be seen from the highway. The highway passes through the capital of Gilgit–Baltistan, Gilgit, and continues through the valleys of Nagar and Hunza, along the Hunza River. Some of the highest mountains and famous glaciers in the Karakoram can be seen from the highway in this section. Finally, the highway meets the Pakistani-Chinese border at Khunjerab Pass. The Karakoram Highway in the Xinjiang region of China. The Chinese section of the Karakoram Highway follows the north-south Sarykol ('Yellow Lake') valley just west of the Tarim Basin. The road from Kashgar goes southwest about 80 kilometres (50 mi) and then turns west to enter the Gez (Ghez) River canyon between Chakragil mountain on the north and Kongur mountain on the south. 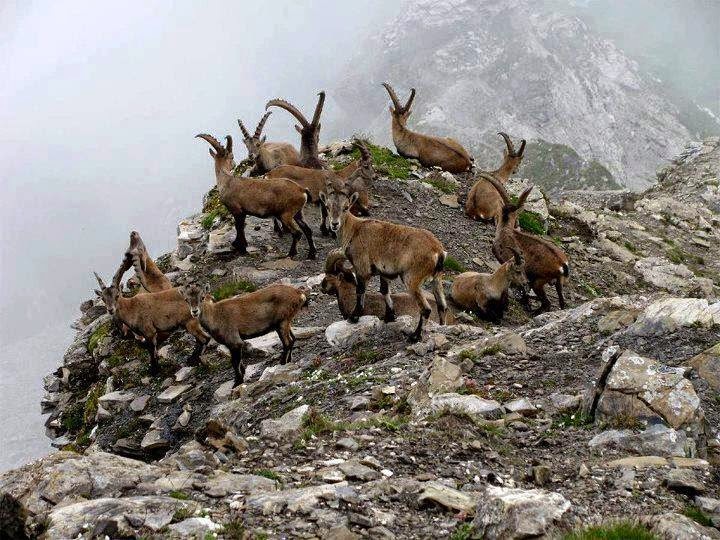 From the Gez canyon the population becomes Kirgiz. Having climbed up to the valley, the road turns south past Kongur, Karakul Lake, and Muztagh Ata on the east. Below Muztagh Ata, a new road goes west over the Kulma Pass to join the Pamir Highway in Gorno-Badakhshan, Tajikistan. The main road continues over a low pass (where the population becomes Tajik) and descends to Tashkurgan. Further south a valley and jeep track leads west towards the Wakhjir Pass to the Wakhan Corridor. Next the road turns west to a checkpost and small settlement at Pirali, and then the Khunjerab Pass, beyond which is Pakistan, the Khunjerab River and Hunza. Kashgar - Chinese railhead - 1,435 mm (4 ft 8 1⁄2 in) gauge. In recent years the highway has become an adventure tourism destination. It was ranked as the 3rd best Tourist Destination in Pakistan by The Guardian. The road has given mountaineers and cyclists easier access to the many high mountains, glaciers, and lakes in the area. The highway provides access to Gilgit and Skardu from Islamabad by road. These are the two major hubs for mountaineering expeditions in the Gilgit–Baltistan region of Pakistan-administered Kashmir. The Gilgit–Baltistan Administration of Pakistan and the Xinjiang Administration of China have signed an agreement to issue border passes to their permanent residents. This pass is valid for a calendar year and is used to travel through Khunjerab Pass only. KKH along the Indus River, 2001. There are more than 50,000 pieces of rock art and petroglyphs all along the highway that are concentrated at ten major sites between Hunza and Shatial. The carvings were left by various invaders, traders, and pilgrims who passed along the trade route, as well as by locals. The earliest date back to between 5000 BC and 1000 BC, showing single animals, triangular men, and hunting scenes in which the animals are larger than the hunters. These carvings were pecked into the rock with stone tools and are covered with a thick patina that yields their age. The KKH is best travelled in the spring or early autumn. Heavy snow during harsh winters can shut the highway down for extended periods. Heavy monsoon rains around July and August cause occasional landslides that can block the road for hours or more. The border crossing between China and Pakistan at Khunjerab Pass is open only between May 1 and December 31 of every year.